What is Log Kill and why does it matter? Disinfection professionals today are generally concerned with what percentage of a given germ is killed by a particular process or disinfectant. The highest percentage that is generally used is 99.9999%. In scientific research papers, this percentage is written as “ a 6 log10 reduction”, but in medical shorthand, it’s known as “a greater-than 6-log reduction” or “a log-6 kill rate.” ‘Log’ is short for logarithm, a mathematical term for a power to which a number can be raised. Log rates are calculated using a logarithmic scale. Log reduction stands for a 10-fold (or one decimal point) reduction in bacteria, meaning the disinfectant or biocide reduces the number of live bacteria by 90 per cent for every step. The log reduction achieved by a decontamination process is a measure of the reduction in the concentration of a contaminant and therefore the reduction of risk. The name reflects that the measure is expressed on a logarithmic scale, using base 10. An increase by 1 corresponds to a reduction in the concentration of the contaminant by a factor of 10. A 0-log reduction means that there is no reduction. A 1-log reduction would correspond to a reduction of 90 per cent from the original concentration. A 2-log reduction corresponds to a reduction of 99 per cent from the original concentration and so on. Mathematically, the log reduction is the base-10 logarithm of the ratio between the concentrations before and after treatment. Generally, you can say that log Kill is a description of how effective a product is at killing pathogens and Log Reduction is the description of how much of the pathogen will be killed. • A 6-log kill reduces the colony to 1 MRSA bacterium after a 99.9999% reduction. In terms of infection control, ‘Log Reductions’ convey how effective a product is at reducing pathogens. The greater the log reduction the more effective the product is at killing bacteria and other pathogens that can cause infections. 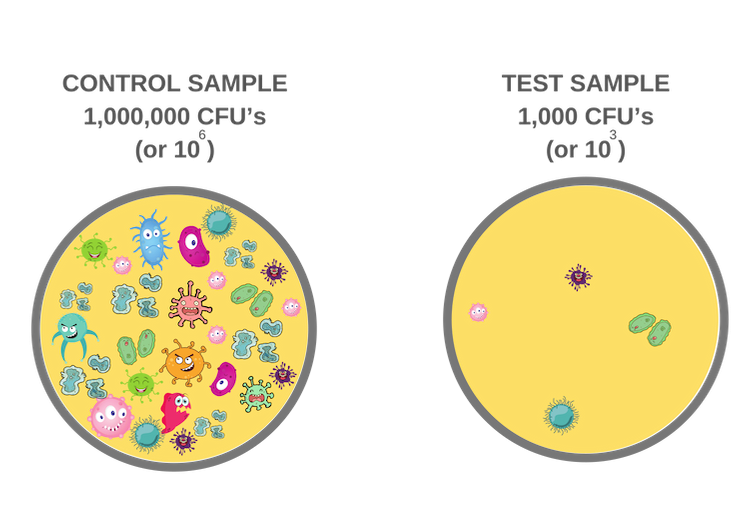 During product efficacy testing, the microbiology laboratories count the number of colony forming units (CFU's is shorthand for the actual number of individual bacteria present) of the given pathogen at the start of the test. They then apply the disinfection product being tested, alongside a control product and wait the required test time before recounting the number of CFU's present. The result of the difference between the control and the test product is then expressed as a Log reduction. For example, if the number of CFU's in the control was found to be 1,000,000 (or 106) and the end result using the product was only 1,000 (103), that would be a Log reduction of 3 or a reduction of 99.9% as in the illustration below. As a basic rule of thumb, for every additional Log reduction number, you add a 9 to the percentage reduction – so a log reduction of 3, as illustrated above, is a 99.9% reduction compared with a log reduction of 6 which is equivalent to a 99.9999% reduction. Log 6 Kill is regarded as a medical grade sanitising and disinfecting agent.